The country that started the Arab Spring made its first step towards pluralistic, representative governance. 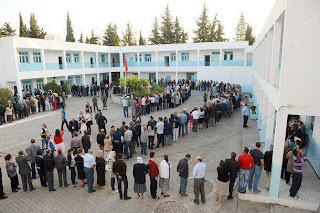 On October 23, 2011 and before the eyes of hundreds of national and international monitors, observers, and reporters, Tunisians lined up to elect their representatives for the Constituency Council (Assembly). Nearly ten months after the overthrow of the authoritarian ruler, Ben Ali, more than seven million Tunisians voted. I had the honor to observe the process before, during, and immediately after the elections and I was astounded by the level of professionalism, transparency, and integrity of the process. I will write about the meaning and implications in the near future; but I wanted to share some of the statistics of these elections for that tells just as important of a story as the outcome itself. To meet the aspirations of the revolution, an independent commission was tasked with organizing the elections (Independent High Commission for the Elections). Out of the total of 1624 lists that sought approval to compete in the elections, 1519 were approved and the rest (about 7%) were denied participation for not meeting the established standards. These lists were a mixture of independents (655), political parties (830), and coalitions (34) competing in some or all of the 27 districts. Each list has a leader; 93% of these leaders were males and 50% of the persons on the lists were under the age of 47 years. Al-Nahda won 41.47 per cent of the vote (90 of the 217 seats). The Congress for the Republic Party won 30 seats, while al-Takattul came third with 21 seats closely followed by the Popular Petition with 19 seats. 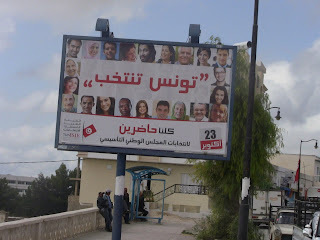 The Progressive Democratic Party (PDP), the opposition party since the days of Bourguiba and Ben Ali won only 17 seats. The remaining 40 seats were carried by other lists and parties. The Popular Petition had nine of its seats won in six constituencies eliminated reportedly for breaking the election laws on financing campaigns. One seat in France was invalidated following allegations that the head of the list had an active role within the RCD—the party of the former dictator.